When a small book by the name of Once Upon a Time When We Were Colored tumbled out upon the table of public scrutiny, author Clifton Taulbert had no idea how God would use his small offering. Like the boy with five loaves and two fishes, a brown-bag lunch in the hands of Jesus became a feast of contentment and hope for thousands. In this simple telling of how unknowing obedience to God had a global impact upon untold numbers of lives, Clifton Taulbert once again shares the themes of life and faith and hope that transformed his future. No matter how small an offering you have, when you follow that God-nudge in your heart, you will begin a journey that takes little and turns it into much. From Glen Allan, Mississippi, to the Capitol building and beyond the seas, follow author Clifton Taulbert’s story of what God can do with a small bag of food for the hungry heart. Following high school graduation and a short banking career in Saint Louis, Taulbert enlisted in the United States Air force. 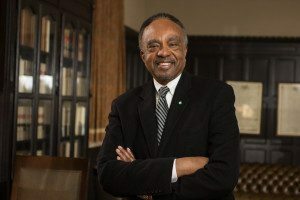 After successfully serving in the 89th Presidential Wing of the United States Air Force in the late 1960s, Taulbert was honorably discharged and continued his college education, graduating from Oral Roberts University and the Southwest Graduate School of Banking at Southern Methodist University. During those years, Taulbert was quietly writing. His first book Once Upon A Time When We Were Colored became a national best seller, a major motion picture and a requested gift for Nelson Mandela upon his release from prison. Eight Habits of the Heart, one of Taulbert’s thirteen books garnered him an invitation by former Supreme Court Justice, Sandra day O’Connor to address members of the court and their invited guests. Taulbert’s literary work ignited the journey that has taken him throughout the world. As a recognized thought leader on the issues of community, Taulbert has lectured at Harvard University Principals Center and the United States Air Force Academy. Taulbert also serves as a knowledge source content provider to Korn Ferry International. The University of Tulsa Trustee, The National Character Education Partnership, Board Member, The Tulsa Area Salvation Army Advisory Board Member, The Tulsa Historical Society Board Member, The Natchez Literary & Cinema Celebration-Board Member, Oklahoma Foundation For Excellence Advisory Board, The Eudora Welty Foundation Advisory Board Member, The Movie Guide Award-Board of Reference, Oral Roberts University-Board of reference, Founding Member of the Anne Kathryn Taulbert Sickle Cell Fund. Taulbert was chosen by CNN at the turn of the millennium to be one of the voices of community. He has also been inducted into the United States Enlisted Airmen Hall of Fame and inducted into SMEI Academy of Achievement: The Free Enterprise System. Taulbert has been honored as the National Jewish Humanitarian of the Year & Arthritis Foundation Volunteer of the Year and recognized by the NAACP 27th Annual Image Award for contribution to literature. The Last Train North, his second book was nominated for the Pulitzer Prize. He was the first African-American to win the Mississippi Institute of Arts and Letters Award for Non-Fiction. Taulbert celebrates life with his family—his wife Barbara and their adult son, Marshall Danzy Taulbert, an aspiring actor and writer.